Calamus pogonacanthus Becc. ex H.J.P.Winkl. Widespread throughout Brunei and the rest of Borneo; endemic. 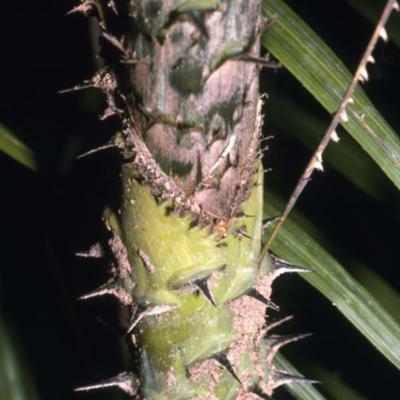 Clustering moderate very variable rattan climbing to 30 m or more; stem without sheaths to 15 mm diam., with sheaths to 25 mm diam., internodes to 30 cm. 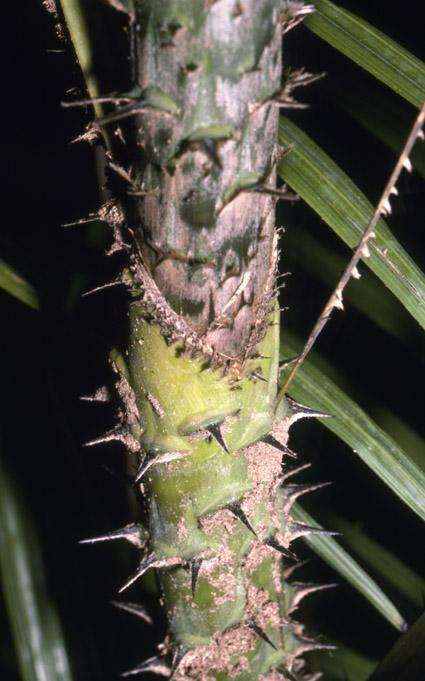 Sheaths dull to bright green, covered with deciduous brown scales and scattered spines with concave bases and black hairy margins, the spines varying from 2-30 mm on the same sheath or, more often, rather uniform, 10-25 mm; knee conspicuous; ocrea inconspicuous, to 5 mm with few small spines. Vestigial flagellum present, erect, to 30 cm. Leaf cirrate, to 2 m long, including the short petiole to 10 cm and the cirrus to 80 cm, cirrus bearing scattered rather than neatly grouped spines; leaflets c. 20-25 on each side of the rachis, irregularly arranged, usually subregular near the base and grouped in 3’s or 4’s near the cirrus, rarely ± regular throughout, the longest to 40 × 2 cm, armed with scattered bristles along the main veins on both surfaces. Inflorescences superficially similar, to c. 1.5 m with up to 8 lax partial inflorescences arranged rather regularly; main bracts tubular, armed with scattered spines, scarcely splitting; male rachilla to 30 × 3 mm, female to 150 × 4 mm; bracts and bracteoles dull dirty brown. Mature fruit spherical or somewhat depressed, to 8 × 10 mm, tipped with a beak to 1.5 × 1.5 mm and covered with 24 vertical rows of pale straw-coloured scales; seed c. 8 mm diam. ; endosperm deeply ruminate. Seedling leaf bifid. (Fig. 39.). Produces a good quality cane which is used locally when rotan sega (Calamus optimus) is unavailable.